One of the most crucial phases of a child’s growing years is 2 to 12 years of age. During this period, children undergo a significant increase in physical development and mental development. Your child’s fussy eating may lead to nutrition gaps which may affect their growth. Ideal physical growth and mental development happens only with adequate nutrition. 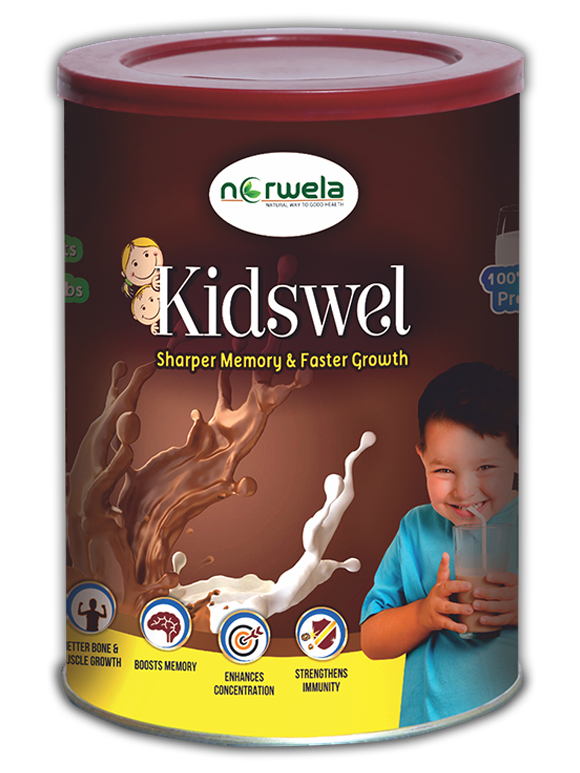 KIDSWEL – NORWELA’s trusted brand for adequate nutrition for children. KIDSWEL is a science-based nutritional & herbal supplement that provides complete, balanced nutrition and memory support for children from age 2 to 12 – those special years of rapid growth and mental development. Formulated with 36 vital nutrients and 5 herbs, When consumed in proper amounts, KIDSWEL is scientifically formulated to provide 100% of the energy, vitamins, minerals, protein, fats, carbohydrates, essential herbs, probiotics and specialised ingredients like Co-enzyme Q 10, Taurine, Choline, DHA etc. It has 100% milk protein, which contains 9 amino acids, Immunoglobulin and enzymes for faster growth. Instruction for use: To prepare a 200ml serving, pour 185 ml of lukewarm milk into a cup and gradually mix 20gms of Kidswel powder. Once mixed, Kidswel should be consumed immediately or refrigerate, drink within 24 hours. It tastes delicious with milk.